How To Overcome Fear ebook. Now Only $9.99!!! 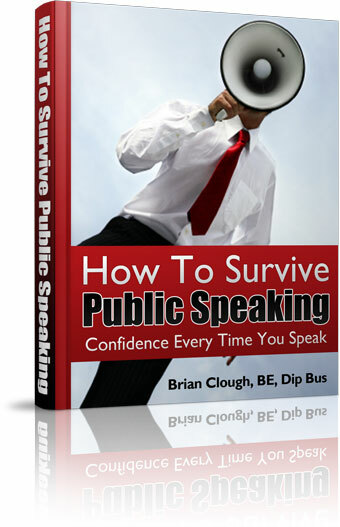 How To Survive Public Speaking - Now Only $9.99! If you've ever wanted to learn how to overcome fear when you speak in public then read on. You're only a few seconds away from getting hold of the book you need. Instead I'm just going to pretend I'm talking to another human. The ebook only costs US$9.99. I wrote it because I'm not afraid of public speaking, and lots of people tell me they are. I wrote it because lots of people tell me I'm a very good public speaker, and most people aren't. (If that offends you then you're probably not ready for the ebook). I wrote it because I've read and heard so much stupid advice about how to overcome the fear of public speaking. Chapter 1 - The 3 Things You Need To Survive Public Speaking. Without these three things you can forget ever speaking with no fear. The best you'll do is minimize the fear without them. Trouble is you'll still be afraid like everyone else who visualizes the audience in the underpants, or pumps themselves up backstage. Chapter 2 - How To Survive The Initial Terror. Here you'll find out the real reason you get scared when someone asks you to speak. You'll learn how to go from quivering mouse to quietly confident human again. You'll never be afraid of stepping up again. Chapter 3 - How To Survive The Preparation. You'll learn the mistakes just about all speakers make while they're writing or preparing their presentation. Chapter 4 - How To Survive Just before You Speak. Here's the biggie for most people. The pain of the public speaking fear often gets most acute in the few minutes just before you get up in front of your audience. One of the insights in this chapter is powerful enough to remove all of the suffering for good. Imagine smiling confidently just before you go up on stage and actually meaning it! This chapter shows you how. Chapter 5 - How To Survive While You’re Speaking In Public. Although quite rare, some people suffer too much during their actual speech or presentation. There's a few simple things you need to know to fix that. Chapter 6 - How To Survive When Disaster Strikes. You'll love this chapter. If you experience anything as extreme as some of these stories let me know! Otherwise just use them and the key lessons behind them, to fill you with confidence about dealing with your own inevitable hiccups along the way. Chapter 7 - How To Survive The Aftermath. Believe it or not, some people suffer just as much after their performance as before. Learn how to stay sane for the rest of your life no matter how your speech goes! Chapter 8 - How To Move Beyond Survival. This final chapter is the most important by far. It points you in a new direction. It opens up a new possibility for you. A life completely free of all fear of speaking in public. This ebook is about how to overcome fear. Public speaking just happens to be a very common, very painful fear, and it's an area in which you can gets lots of practice and tons of feedback. If you're afraid of anything at all, learn how to speak confidently in public. This how to overcome fear ebook isn't as long as War And Peace. That's because it doesn't need to be. It's long enough to help you see public speaking in a completely new light. It's short enough so you'll read the whole thing. Far more importantly though, it's clear enough so you'll know exactly how to overcome fear, and release its hold on your life. Click on the Order Now button. Any questions please contact us.